Just made a clever little upgrade to my computer which I thought I’d share. In previous blogs I talked about the joys and pains of my Apple desktop behemoth. These Mac Pro computers are big and powerful, but also surprisingly easy to upgrade. The procedures to install new memory or hard disk drives are pretty much plug and play. I’d upgraded the memory (Photoshop runs faster) and hard disk drives (big photos need lots of room) and things were running fine. My friend Steve (not Jobs) advised me about the next step – a solid-state drive. A solid-state drive (SSD) has several advantages over a standard hard disk drive (HDD). As they have no moving parts, they are more reliable and can access data faster. They’re also silent and run cooler than HDDs. The main drawback is that they are far more expensive per GB of capacity. For those people who are still using desktops that can hold multiple drives there is a fantastic opportunity. You use cheaper, much larger HDDs for storing the data (music, videos, documents, photographs) and a faster SSD for startup and applications. 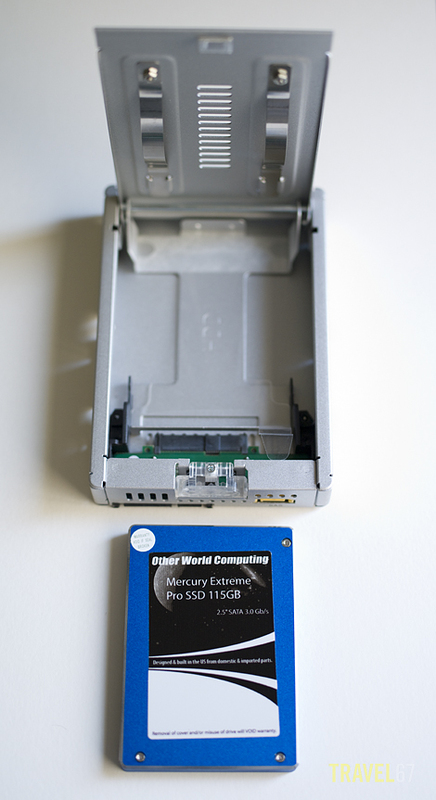 Last week I ordered a 115 GB SSD along with a converter so that the 2.5″ drive would slot into the 3.5″ drive bay. Cost including shipping to Japan was around US$250. Yesterday I installed the drive, and then used the Apple startup disk to transfer the data from the old HDD to the new SSD then switch the drive that OSX boots from. Everything worked without any glitches. The computer now starts up faster, applications run faster and there is the extra bonus of reliability. If you’ve got multiple drives in your computer this is well recommended. I think you mean HDD instead of HHD. Thanks Al. It appears that I need to upgrade my brain processor. I think I have a late generation X model. It seems to be running slow sometimes. Just wait a couple of years Dave and something newer and faster will appear on the market at half the price! Or just get used to wandering off to make a cup of tea or check emails when you’re waiting for the beach ball to stop spinning.